When Degas urged his fellow artists to join him in a "realist" endeavor, he was referring to the creation of paintings grounded in contemporary life and actual experiences. Rather than perpetuate idealized images of mythological figures and historical subjects, Degas wanted to paint everyday urban scenes. 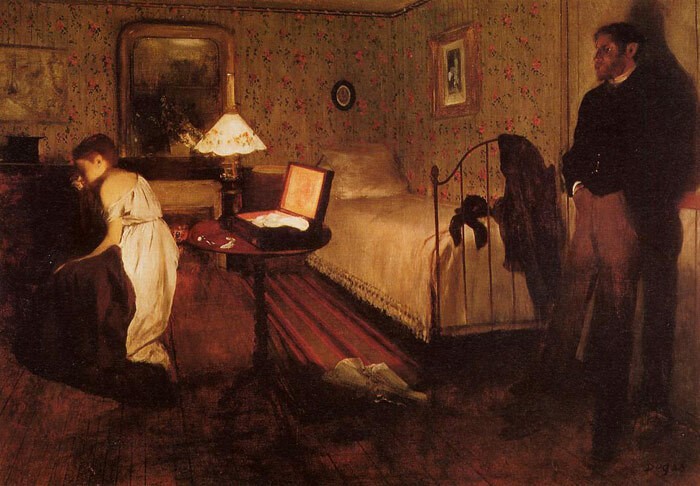 This interest is reflected in Degas's early paintings. His interiors and portraits, for example, reveal the ambiguities inherent in human relationships. Many of paintings of the late 1850s to mid-1860s focus on the tensions between men and women. People in Degas's paintings are portrayed enigmatically; their facial expressions and postures compel the viewer to ask questions about them and the meaning of particular scenarios. SPECIAL NOTE : The painter will make the reproduction as close to the original oil painting as possible. If you want your painting to alter from this likeness, please email us and " Interior, c.1868 " will be reproduced according to your special requirements.